Cottage in Venn Ottery, , East Devon - Peaceful, Tranquil with hot tub. Burrows is a detached barn conversion sleeping six. Quality in Tourism 5 Star rated. It is accessed via its own driveway and with its own secluded and private garden. The property is in a very peaceful and rural location in the Otter Valley, with views of the surrounding countryside. Venn Ottery is only 4 miles from the elegant Georgian seaside resort and beaches of Sidmouth and easily accessible with both the A30 and M5 within a 10 minute drive. The nearest pub is 1 mile away serving local fresh produce and good beer. The River Otter and numerous countryside walks are on the doorstep. The cottage has an abundance of original features including beams and vaulted ceiling. A real home from home it provides all the facilities you will need for your holiday including oil fired central heating, electric range cooker and gas hob, fridge/freezer, dishwasher, microwave, washer/dryer, TV/DVD Player, radio/CD player, gas barbecue and various garden furniture. It has off street parking for three cars. My husband and I bought the farm with 15 acres, some 11years ago. We always loved the house, and often drove past it... never dreamed of ever living here. Now we live here with our three children. It has been a huge amount of work, a labour of love. We are both involved in our other businesses, but from the start we knew we had to develop the barns, to enable us to share them with others. Both buildings are Grade 11 listed and the first to be developed was Apple Mill. This is where the cider was made and apples stored for the farm. Burrows followed two years later and was originally used as a potato store. Our plan has always been to create a home from home. We monitor everything to enable each new guest to have as enjoyable and comfortable a holiday as possible. A place to unwind and recharge, but at the same time loads to do. Fabulous walks, beaches, pubs, quant sea side villages, water sports, riding, some much to do so little time!!! Watch the stars at night from the hot tub or just do a sun downer. All you could every need in a cottage, just like being at home, a real home from home. All bedrooms have their own en-suites, with heated towel rails and slate floors. All 100% Beautiful Cotton Bedding, Feather and Down Duvets and pillows. Open plan sitting room with wooden floors, vaulted beamed ceiling, wood-burning stove,flat screen TV/DVD and CD/radio. Comfortable three and four seater settees plus easy chairs. There are two large French doors that open out onto the sun terrace. Welcome hamper on arrival. Devon Cream Tea. Beautiful equipped Kitchen with granite work surfaces,hand made kitchen units, range cooker, large fridge/freezer, dishwasher, microwave, food processor, dinning table and dresser. All the pot and pans you would every need, the cooks will love it! Basket of toys, and games! Bikes need to be requested from owners. Woodbury Park Golf and Country Club is only a ten minute drive away. The property is arranged over a ground floor but there are various steps surrounding the property and gardens. Your very own hot tub to enjoy, Just outside on the deck, great for sun downers and star watching. Notes on accommodation: Children and babies are welcome but we cannot, unfortunately, accept pets. This is a non-smoking property and request that you smoke outside only. There is off-raod parking for three cars. Two bicycles are available for guest use. Outside: There is a secluded outdoor garden area with sun-trap terrace and pretty views of the surrounding countryside. There is a Six seater Hot Tub, for your use, great sun downers. Guests have full use of the gas - barbecue and a range of garden furniture. Utility Room: Tumble dryer, Iron and ironing board. Clothes airer. Cleaning / Towels / Linen / Clean linen and towels are provided and changed weekly unless otherwise requested. Each guest will find a bath and hand towel, soap and shower gel/shampoo. Bathrooms have cotton wool and toilet tissue. Bedding 100% cotton & feather duvets & pillows. Other: Open plan kitchen/diner with large wooden farmhouse table. Outside there is a south-west facing sun-trap terrace complete with garden furniture and gas barbecue. Additional field available for ball games, etc. We were greeted with a wonderful welcome pack, with loads of local produce. 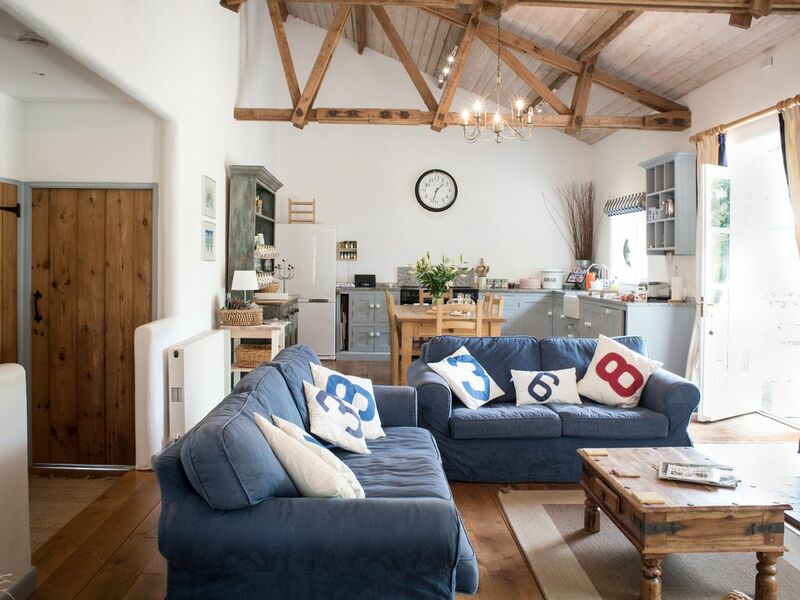 The barn is very spacious, luxuriously appointed and very clean. Everything you could possibly need has been thought of. If in the very unlikely event of needing something else, the very helpful owners are on site. There is plenty to do locally, and the barn has the most comprehensive information pack we had ever seen. We really enjoyed Seaton, Beer, Branscombe and Budleigh Salterton. Great food at the River Cottage Canteen in Axminster and the Golden Lion in Tipton St John. The garden is a great suntrap, secluded and private. We really enjoyed lounging in the hot tub, a real treat! Thank you so much for your kind words. It was a real delight to have you staying at Burrows, you are 5 star guests. Always welcome. We love it when guests return! Thank you so much for those very kind words. We try and give our guests a real home from home feel with lots of treats. Thank you for being 5 star guests. Do hope you now feel relaxed and recharged. Please join us on Facebook, Pebblebed Cottages. Looking forward to welcoming back to Burrows. Wonderful weekend in a stunning cottage! A beautiful property in the beautiful Devon countryside. There was a cream tea waiting for us on arrival as well as a lovely hamper. Comfy beds and lovely bathrooms with a spacious open plan kitchen dining room and living area. We are planning to return next year. Thank you for your very kind words. Girls were a delight, good to escape sometime, you are always welcome!!! Hope to see you next year. We have just returned from another glorious stay at The Burrows. On arrival we received another delicious hamper of goodies and as ever the table was graced with a vase of delightful flowers - it may sound like a small thing but it's this attention to detail that marks The Burrows out as a truly, genuinely luxurious experience. The property was immaculate and we had everything we could possibly need, even a couple of bikes to go for a lovely ride across the countryside or down to the outstanding village pub. At The Burrows you can spend your days listening to bird song and your evenings in the hot tub gazing at the stars. It really is a little taste of heaven. If you are in need of getting away from it all! The Burrows is the place to be. Delightful to see you both again. Trust you had a fabulous escape! Thank you both for looking after Burrows. The cows are missing you, hope you have enjoyed feeding them? Such kind word in your review, thank you. Hope welcome you back to Burrows soon. From the fossils to be found at Charmouth and Lyme Regis, via the red cliffs of Beer down to the glorious white sands of Exmouth there are an abundance of wonderful beaches along this famous Jurassic coast line, all within a short drive of this property. Beer beach is a pretty pebble fishing cove around a twenty min drive. The bustling regency town of Sidmouth is only four miles away. Budleigh Salterton and Exmouth with it white sands and watersports are within a 15 minute drive. The property is within a 10 minute drive of both the M5 and A30, with Exeter Airport only five miles away. A car is required in order to visit most local attractions including the local coast. There are regular bus services from nearby Ottery St Mary and Honiton. The nearest train stations can be found at the villages of Feniton and Whimple within a twenty minute drive, with regular services into Exeter and surrounding towns. Many idyllic villages and towns cut through this part of East Devon. Search for antiques in Honiton and visit Topsham on the Exe estuary for wonderful gifts. Sidmouth is four miles away and has many interesting shops and restaurants. Lyme Regis is a 25 min drive and well worth a visit for its pretty town, wonderful seafood restaurants and famous harbour cobb. Beer and Branscombe are also nearby as is Exeter City centre with its stunning Cathedral. Kids will enjoy Bicton Park and Escot woods. Within the cottage there is an extensive home produced manual covering all the best places to visit and eat out. There are also details of the inhouse catering service available. Useful local facilities include - Local village shop and garage in Tipton (1m). Waitrose in Sidmouth (4m). Tesco in Honiton (5m). Local butchers, bakers, banks, hairdressers, doctor, pharmacy & drop in hospital in Ottery St Mary (2m). Organic farm shop, gifts and restaurant at Joshuas Harvest Store, and Otter Nurseries garden centre - both Ottery St Mary. Darts farm for everything wonderful at nearby Topsham. Good food - there are an abundance of good eateries in the surrounding area serving locally sourced produce. Many have extensive fish menus serving freshly caught stock. Kids can be kept entertained with a number of adventure centres within a short drive, including Bicton gardens, Escot gardens and woodland adventure, plus Crealy for fun-rides. Watersports can be undertaken at 'The Edge' at Exmouth and canoes and bikes can be hired at 'The Quay' in Exeter. Take the oldfashioned tram from nearby Colyton to the beach at Seaton for fish and chips. The famous Donkey Sanctuary is nearby as is The Miniature Pony Centre. Horse riding, fishing, cycling and sailing are all within easy reach of this holiday accommodation. Throughout the summer there are sailing regattas, beer and music festivals, farmers markets and village fetes - something for the whole family. A welcome hamper will be provided upon arrival. Should guests wish to pre-order food for their stay, then they can do so via Waitrose in Sidmouth.